I never buy processed food. Even a jar of tomato sauce contains a lot of sugar, salt and preservatives. I buy fresh food and cook it myself. Now is the season for Navel oranges where I live. I buy them to a farmer of my town for half an euro a Kg. 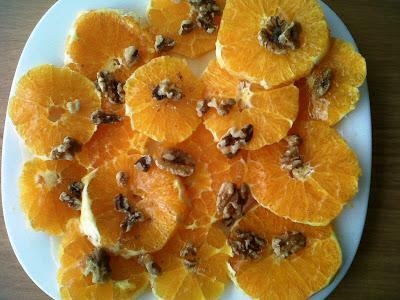 I add to them a little of raw orange blossom honey and some nuts. Cheap, healthy and delicious. A big problem of our time is that many young people no longer learn how to cook properly. I often observe that young people without work resort to ready meals, although they don't have the money for this but they have the time to cook. Cooking yourself is not more expensive, but warming up finished food is more convenient. I agree with you 100% that the finished products contain far too much sugar and salt.It is well known that these products are too expensive, make us obese and cause heart and circulatory problems. And yet there are fewer and fewer people who eat like you. I am glad that my wife can cook and almost exclusively buys fresh seasonal products.And I am glad that my wife taught all our children how to cook. Can you blame the young people if their parents haven't learned it yet? Certainly not an accusation, but it is not an excuse either. Anyone can learn it. Josè, you probably do triathlon too? Man, you are a super programmer, you live healthy and you are probably rich too? The only stuff they grow here are Corn, Peanuts, Pecan, Sunflowers and cotton. O and cattle, loads of cattle everywhere. Not a single Orange or fruit tree in 300km. To dry and immensely hot. There is a saying here "Never trust a skinny chef", but it seems you have it worked out pretty well. My previous branch was far from here and at least we had bucketloads of cherries & asparagus, but that was about it. Nowadays all the farms had been commercialized and they pack and store onsite to ship out. Nobody here sells directly to the public anymore. Seems you have it good there. As a Spanish philosopher said, "I am myself and my circumstance". I was born in the Horta of Valencia, an ideal place to grown vegetables, oranges and rice, but not cattle. Therefore, we did eat a lot of vegetables, fruits, rice, legumes and fish, and little meat (mainly chicken, rabbit, pork and lamb). Rice is our speciality: not only the world famous paella valenciana, but we have more than 300 different recipes. Like rice has no flavor of its own and it absorbs the flavor of the added condiments, it never tires you (as long as you don't eat paella everyday...). If I had been born in a different place, no doubt that my diet would be different. I have been lucky that what we had to eat was tasty and healthy. Now it is very different. The young generations have become adept to junk food and obesity has become a big problem. It is very sad to see this happening in a country famous by its cuisine. We also used to walk a lot; now we are seeing and increasing number of young boys using kick scooters. The consequences of junk food are known: obesity, diabetes, cholesterol, etc. You live less and in worse condition. But I not only follow and healthy diet because it is better for my health, but also because I like it more. Instead of a burger and a soft drink, it is much better a portion of Spanish omelette with a glass of wine, or any other of our famous "tapas". In the same way that facebook, twitter, google etc have teams of folk designed to hook you in and keep you addicted, the fast food companies have teams of people knowing the exact amount of fat and sugars to get you addicted to their products. Unfortunately many folk have an 'addictive gene', and it is very hard work for them to resist. Folk I know have had there stomach stapled, most of their gut removed, but still try and eat the manufactured rubbish. Of course, difficult for some to resist the advertising, red bull being a prime example. It was banned in many countries due to its harmfulness, but money changes hands at high levels, and now it is accepted, more or less world wide. afaik, coca cola don't sell much in Scotland, and I'm not sure if starbucks are in Italy yet. For folk in an urban environment, ones used to 'sell by dates instead of using their nose, getting good fresh food would be a logistics nightmare. Over here, in UK, very difficult to get anything fresh in the supermarkets - tomatoes are wood chips and water, apples are a year old (kept in a cool gassed environment in large warehouses), lots of 'buy now, rot at home', mixed leaves in a bag filled with a gas to keep 'em fresh, and they wilt within half hour of bag being opened - but it's cheap compared to more artisan suppliers. Their used to be a season for apples and pears, beans, potatoes, etc. Now stuff shipped world wide, parts of the world being deforested to produce the latest fad of beans, coffee, whatever. But few care. apparently many young families do not have a dining room table in their homes. I suppose, as I grew up with the remnants of food rationing, in UK, after ww2, My taste is not the same as most younger folk. Read this and understand taht a "Human made CLimate Change" is just a new Pseudo religion. This thread was about eating healthy, not about climate change, so please don't act like a troll. If you want do something to additionally improve your halth, Jose look for alkaline water. I have much better knowledge in healthy diet then in programming :-) so you can ask me if you want to progress on that. Perhaps you can explain the coloured chart you've posted. What do the numbers signify? Why is it that fruit juices have the group number 6, whereas lemons have the group number 10. I've always thought that most fruits are acidic e.g. lemons, limes, apples.